Offering a custom Sunbrella cushion solution at discounted factory direct pricing on all Sears patio furniture collections! 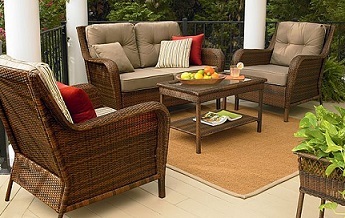 Did your patio cushions fail to last even 2 seasons? Looking to replace them with something that lasts up to a decade? You have come to the right place! Offering Sunbrella cushions for all Martha Stewart Patio Furniture Collections including the Martha Stewart Everyday Outdoor Patio Collection including the sofa, dining chairs, chaise lounge, rocker, high back dining chairs, bar chairs,reclining dining chairs, ottoman and gazebo! Also Offering Sunbrella cushions for the entire Hampton Bay outdoor Furniture line and Garden Oasis Patio Furniture Collections!